Renowned for its vibrant and friendly atmosphere, Canterbury combines an exciting contemporary buzz with years of tradition and history. In fact, this international destination has been a centre of learning since St Augustine established his first Cathedral and Abbey here around AD600. 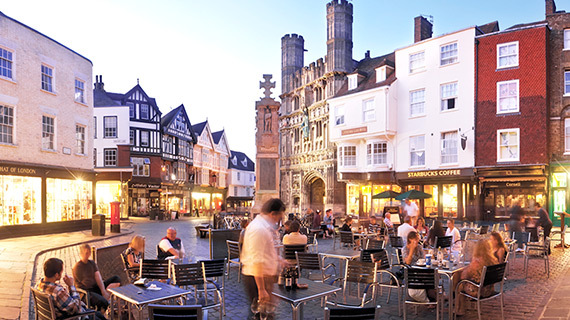 Now Canterbury, a World Heritage site, is home to three universities, a world renowned Cathedral, as well as a host of shops, bars and restaurants. Wherever you’re from you can look forward to enjoying all it has to offer, with confidence. Take a look at our attractions page to find out what to do in and around this lovely city. If you are visiting the city for business, why not check out our residential conference page to find out how we can help. Canterbury is a beautiful cathedral city nestled in Kent which is fondly known as the ‘Garden of England’. The ancient city wall, originally built by the Romans, encircles the medieval town centre which boasts cobbled streets and timber-framed houses, with an abundance of shops and restaurants to suit everyone’s needs. Canterbury Cathedral, founded 597 A.D., is the headquarters of the Church of England and Anglican Communion and is recognised as a UNESCO World Heritage Site. Canterbury features many other great tourist attractions like the Canterbury Tales, Historic River Tours and St Augustine’s Abbey. Please see below for further things to do whilst staying here. canterbury.vacations is a service offered by Canterbury Christ Church University and therefore falls under the institutional website terms, conditions and privacy policies. for further details, please visit: https://www.canterbury.ac.uk/legal © 2018 Canterbury Vacations.